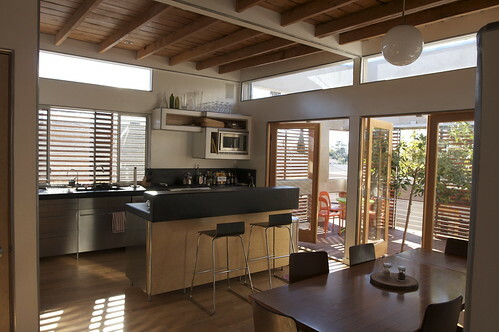 Kitchen, upload feito originalmente por Jeremy Levine Design. All the kitchen countertops are made with a mix that includes recycled fly ash and natural black pigment. A chalkboard wall, pantry, and refrigerator are built into a sculptural wall that falls short of the ceiling which sails overhead connecting the kitchen to the other spaces.